For twenty-one years, Dan Gable's Iowa Hawkeyes dominated wrestling to an extent rarely seen in any sport: twenty-one consecutive Big 10 titles and fifteen national championships. In A Season on the Mat, award-winning reporter Nolan Zavoral explores Iowa's storied wrestling program and Gable's record of excellence in an unprecedented, intimate look at the man and his methods during his final season as a head coach. A Season on the Mat chronicles the dramatic 1996-97 season, in which Gable led his team -- far from his most talented -- to a record-breaking performance at the national championship, at which it scored the most points in collegiate wrestling history. Zavoral takes the reader behind the scenes into the stifling heat of the wrestling room, where young men from places like Rock Falls, Illinois, or Philip, South Dakota, sacrifice everything they have just to be a part of the Hawkeye program. From his difficult upbringing, interrupted by the tragedy of his sister's brutal murder, through the single defeat that haunts him to this day, to the ups and downs of his phenomenal coaching career, Gable has come to symbolize to many all that is special about this demanding, elemental sport. 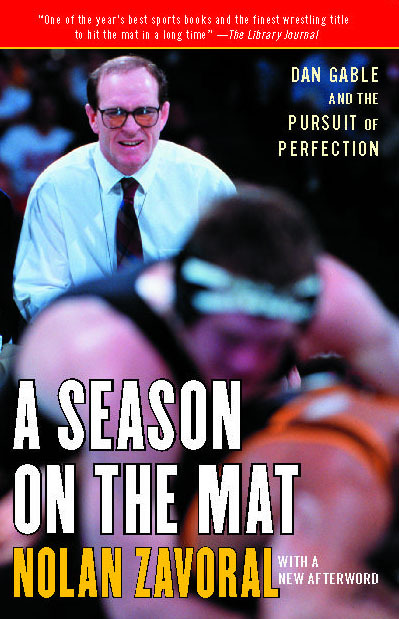 Part biography, part chronicle, part portrait of this unique subculture, A Season on the Mat is the best and most thorough look at one of the most important and most overlooked figures in American athletics.